Dogwood Pacesetters Canine Sports Club is a non-profit club dedicated to promoting canine sports in the Lower Mainland of British Columbia. 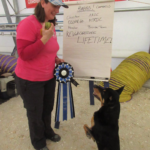 We are affiliated with the Agility Association of Canada. The Dogwood Pacesetters Canine Sports Club has been a central promoter of canine sports in the Lower Mainland of British Columbia since its formation in 1986. We are also active in our community, including holding community demonstrations, and supporting PADS (Pacific Assistance Dogs Society) every year. Dogwood Pacesetters members come from every facet of society and from every part of the Lower Mainland. They range in personality from the most avid competitor to the recreational dog enthusiast. Our members travel to all parts of Canada and the United States to represent our club in various competitions. 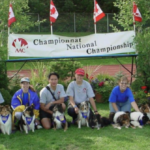 Dogwood Pacesetters was formed in the 1980’s and is one of the original dog Agility clubs based in British Columbia. We are a non-profit club with a mission is to promote the Human-Animal Bond and Responsible canine ownership in our community.